Everything creatives need to know about 8K monitors. Plus the best 5K displays for pros who want to upgrade from 4K. Chances are you’ll have heard of 4K – after all many of us now have 4K monitors – but what about 8K? Naturally display manufacturers always want to upgrade us to the latest standards, but as creatives we’re obviously interested in what's upcoming. While we’ve seen some 5K monitors appear – and we’ll look some of the models available below - 8K should be seen as the next step from 4K for TVs and video production and will become standard in the computing world, too. But although we’re starting to see some 8K displays become available, there’s hardly any 8K video content out there. That’s not such a problem in the computing world as it simply means you can fit more pixels – and so more desktop and higher resolution content – on your screen. But it does mean that mass adoption of 8K TVs and monitors are some way off, probably another decade. In terms of monitors, it’s certainly several years from now before they are a serious option in terms of price. If there are more 8K panels out there, the prices will come down. So if you’re looking for a monitor now it’s still worth taking the plunge. You probably want to check out our guide to the best 4K monitors and take a look at the 5K options below, too. 8K images are 7,680 pixels horizontally by 4,320 vertically. It’s not quite 8,000 pixels wide – hence the 8K name – but it’s close enough. Like 4K (3,840 by 2,160) has double the pixels but four times the resolution of Full HD (1,920 x 1,080), 8K has four times the resolution of 4K (and double the number of pixels). So therefore, 8K is 16 times the resolution of Full HD. All this means that the pixels on 8K displays will be indistinguishable to your eyes because there are over 33 million of them. Like 4K, 8K will also be referred to under the umbrella name of Ultra High Definition (UHD) although it will be interesting to see how manufacturers distinguish that for consumers. 8K monitors will hit the market over the coming years but somebody fired the starting gun early – in 2017 in fact. And that was Dell with its 32-inch UltraSharp UP3218K. It’s expensive at over £3,000 and needs two DisplayPort 1.4 connectors free on your powerful graphics card to display the full resolution at 60hz. Talking about graphics, there aren’t a huge number of graphics chips that currently support 8K – you’ll need a latest-gen AMD Radeon Pro or Nvidia GeForce card to make full use of the resolution. The main problem with using a computer with 8K at the moment is that user interface elements aren’t geared up for such a high resolution – an app like Photoshop CC will only scale its user interface to 200 per cent, which isn’t enough for comfortable use. Dell’s 8K display is clearly ahead of its time, but it’s not looking as futuristic as it did a year ago. That’s because TV manufacturers are also starting to release the initial batch of 8K sets. There are several reasons why manufacturers like Samsung are keen to leap and not just because they like to say they were first. They also want to pull the market with them, so all manufacturers will currently be looking at their options for 8K. Another reason is that 8K content isn’t necessarily required from the off; the powerful image processors inside these TVs will be able to upscale content – so 4K content to 8K. It’s also true that 8K will have impact in the Far East far earlier than in Europe and the US; Japan is expected to launch an 8K TV channel in time for the Tokyo 2020 Olympics, for example. But it’s clear that easily 8K content is a way off. There’s also a problem with the delivery of it – it will need a lot of bandwidth to deliver it, potentially 80-100Mbps, so streaming 8K via broadband connections is also a way off. So we’ve put together a short buying guide to the 8K display that’s available now plus a couple of 5K options if you want to upgrade your existing display. 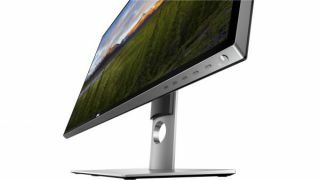 Even though this Dell UltraSharp UP3218K display will look amazing on your desk it’s hard not to wince at the quite considerable price tag. But for your high outlay you will get the future here and now. But unless you’ll need to edit 8K over the next few years or deal with particularly high-res photos, don’t expect to future-proof for a decade in the future. By the time 8K is a fixture, this screen will surely outdated, its IPS screen technology in particular replaced by some of the specifications we’re seeing in high end TVs now, such as OLED – Dell itself has experimented with a 30-inch OLED monitor. Is the 4K model enough? This fully featured and height-adjustable Iiyama display is a budget way of getting that extra K – if a display that costs over £600 could ever be called budget. It’s also one of the only 5K options currently available. It also boasts blue light reduction tech for late night working. The Iiyama has an LED display as you’d expect from a monitor at this price point (many significantly less expensive 4K monitors also have high quality IPS LED panels). Talking of 4K, the equivalent 4K Iiyama is around £160 less, so you’ll need to really want those extra pixels to make this a worthwhile purchase. This smart black IPS LED 5K display has a super-thin bezel but a super high price compared to the Iiyama above; is it really worth the extra? In pure price terms no, but it does boast the compelling addition of Thunderbolt 3, meaning you can attach a single cable directly to one of the ports on your 2016 or later MacBook Pro for both 5K display data and power, too. That’s right you can charge quickly (85W) from the same cable that carries all those pixels. There are also three USB-C downstream ports for connecting up other peripherals. What’s more, the macOS-optimised LG Screen Manager can also be used to divide up your screen into different frames depending on what you need.